We know it may sound obvious, but kids matter. We believe that they not only bring a wonderful innocence and joy — but that they also have gifts, knowledge and a perspective that can benefit us all. That’s why we’ve taken intentional steps to ensure that children have a safe, fun engaging place to learn about God’s love and grow on their own, as well as an invitation to contribute to our community in meaningful ways. This means that every week we have age-specific classrooms for our kids. Here, kids laugh and play and learn and grow as they discover who God is and how their story is wrapped up in God’s story. All classes meet on the lower level of the building. 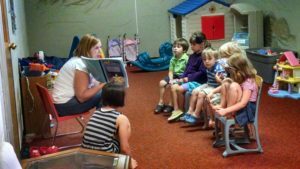 PreSchool: Kids ages 4 – 6 who are in Preschool and Kindergarten. 1st-4th graders start the morning in our worship gathering with parents and are dismissed to their class after a time of musical worship. Here they learn about the Bible and have a space to ask questions, process thoughts and feelings, and form relationships. 5th graders stay in worship until the end of the sermon. Then they are dismissed for a time of discussion with an adult leader. On the last Sunday of every month, our Preschool and Grade School classes do not meet. We call this “Family Day” at The Branch. Kids participate in our main worship gathering on these Sundays. We’ll have coloring pages or other creative activities available. We know it adds a little more noise to our gathered worship and that’s perfectly ok with us! Most weeks you’ll also see our older aged children participating in meaningful ways of their choice to strengthen our community. Kids play an instrument or sing during worship, are taught how to run the sound board, serve alongside adults in the nursery or help make our cafe hospitable.